I hope the new year is off to a great start for you all, wherever you live... I have been missing the NZ summer lately as it has been REALLY cold in our part of the States this winter. However, it is definitely good crafting weather and I've enjoyed spending my evenings curled up on a comfy chair, working on the latest home♥stitch♥ness designs that are due for release VERY SOON! 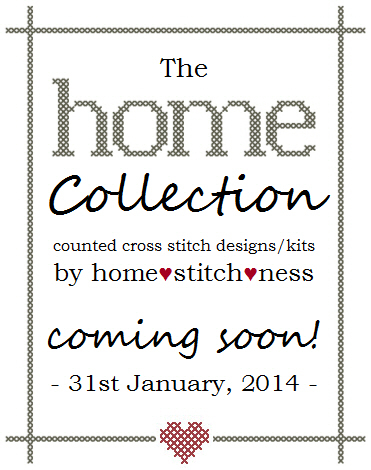 If you follow home♥stitch♥ness on Facebook, you might have noticed that I've been posting a few sneak peeks that give away some clues about the new designs. I'm pretty excited about them - they are a set of three small designs that fit perfectly in a 6"/15cm embroidery hoop so that they can be displayed as hoop wall art when you're finished. They look lovely by themselves, in a pair or as a trio - it will be up to you how many you want to stitch! The designs celebrate the affection we feel toward our homes and feature some of the lovely things we fill them with to make them our own. While there are some definite New Zealand influences in the mix, they are pretty universal and will (hopefully!) appeal to stitchers everywhere. Here is a photo of the gorgeous DMC threads I have chosen for the designs - with so many beautiful colours to choose from, it is definitely one of my favourite steps in the design process! I will be back soon to show you the new releases :o) In the meantime I had better get back to pattern proofing while my little boy naps!